Alexander Alekhine was single-minded in his pursuit of the world championship, and his drive eventually, in 1927, overcame José Raúl Capablanca’s skill. Alekhine’s results were never as dominating as those of the players higher on this list, but he still managed an impressive run. From 1921 through 1927, he competed in 15 major tournaments and won 8 of them. From 1930 to 1934, he won five strong tournaments but let his weakness for drink get the best of him. He lost the title to Max Euwe in 1935, primarily because of his poor physical condition. Alekhine cleaned up his act and won the return match in 1937 to regain the title, which he kept until his death. However, his last years were sad ones. His play was unrecognizable, and his physical condition continued to deteriorate. Nevertheless, Alekhine belongs on this list by virtue of his many tournament and match victories. In one of the great tournaments of his youth (he wasn’t yet 20), at Carlsbad, Germany, in 1911, Alekhine flashed the kind of inspired combinational play with which he would continue to shock and disorient his opponents. After 14 moves against the Polish-American master Oscar Chajes, Alekhine is white in the position shown here. The bishop on c4 is under attack from the black pawn. Alekhine’s white bishop on c4 is under attack by Chajes’s black pawn on b5, a position that would cause most players to look for a retreat square. But most players aren’t Alekine! He knows that black’s uncastled king can be vulnerable, especially because much of his army is undeveloped. Black must capture, or the game is simply lost. So Chajes grabs the bishop and holds on for the ride. White pins black’s knight to his queen. Now black threatens 18… . Qxf1+!, after which he would come out on top. Black could have tried 18… . 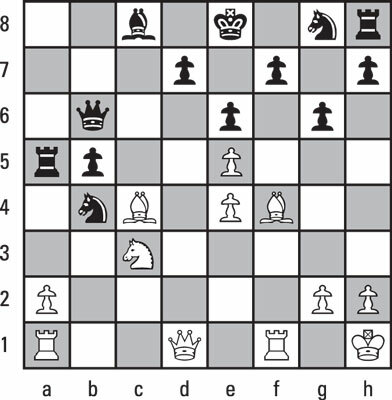 Ne7, with the idea of castling to get the king out of the center. But after 19. Rfd1 Nc8 20.Qxb4 Qxb4 21. Rxb4, Alekhine would have been an Exchange up with a remote passed pawn, winning easily. After Chajes’s 18… . f6, 19. 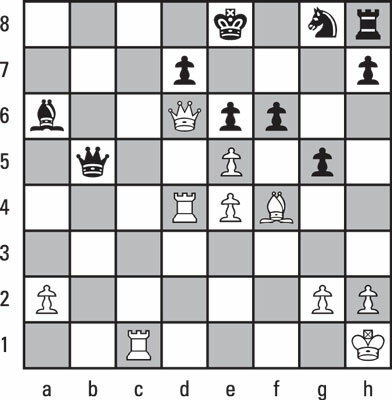 Qxb4 would not have been a threat because black would simply have played 19… . Qxb4, and after 20. Rxb4 Bxf1, Chajes would have had the better game. That’s not what the fierce Alekhine has in mind! Black is trying to trade queens, which would ease his defensive burden, but Alekhine is not about to oblige him (see the following figure). Should white capture the queen on d3? White has a better move than capturing black’s queen. If white had played 20. Qxd3 and black had responded with … Nxd3, black would have had a tough but defensible game. Black’s queen is defending the pawn on d7, but Alekhine has something up his sleeve. 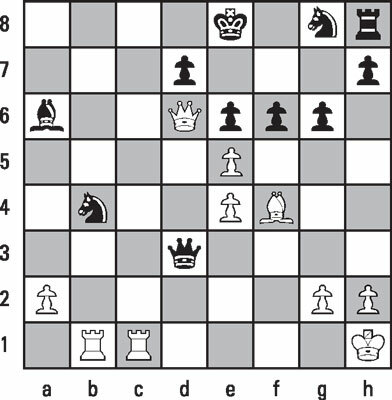 How can white interfere with black’s defense of the pawn on d7? Watch how Alekhine chases the black queen away from its protection of d7. Black calls it quits. If he had saved his queen, he would have been mated quickly after 25. Qxd7+. 1–0.